BACKTIME: Is Harrington the Yin to Tiger's Yang? When Tiger Woods really started to establish himself as the game's dominant force (roughly 10 years ago), a number of would-be challengers have come and gone. And we're still waiting for the Watson to his Nicklaus. We thought it might be David Duval. Or Ernie Els. Or Vijay Singh. Or Phil Mickelson. All have provided challenges, but none have sustained it. Until now? Padraig Harrington may be the guy. At 37 years old, he's got the fitness and fortitude to keep up. He's won 3 of the last 9 Majors, though two without Tiger in the field. Harrington enters PGA Sunday tied for second, just two back from Tiger. But he's not in Tiger's pairing. That's your X factor. Or "Y" factor as the case may be. That's 37-year old Korean Yong-Eun (Y.E.) Yang. He may be ranked just #110 in the world. But he won the Honda Classic earlier this year, and has two Top 10s and a Top 20 at Bridgestone in his last three starts. He is piling up FedexCup points and in his last 3 final rounds he's shot 68, 67, and 66. 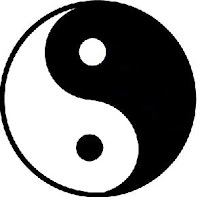 So maybe Yang is the yin to Tiger's yang. Or is he the yang? Before this degenerates into a Abbott & Costello routine (though it's probably too late for that), it's time to remind you that Backtime will provide live updates and perspective from Sunday at Hazeltine. Harrington tees off at 2:36 ET. Woods and Yang at 2:45. Weather could play a factor. 7:12 ET Final thoughts. I'm not sure I can put it into words, except I am thrilled to have watched this from start to finish. After Tiger's bogey, Yang won by three. As it turns out, a 71 for Tiger would have won it, but he shot 75. Yang shot 70 and made history. Forever Yang! 7:05 ET Yang nailed the birdie putt and celebrated on the green while Tiger, still unfinished, stewed in the background. What a surreal moment. 6:58 ET Asked and answered, counselor. Yang hit the best possible approach. Tiger's in the rough. This is 99.9% in the bag. 6:53 ET Both players hammered their drives on #18. Tiger's was a little better. But remember Kenny Perry couldn't hit an iron on #18 to win the Masters so Yang has a pressure shot coming. 6:49 ET Tiger made a horrible pitch at #17 and made bogey. But Yang made a horrible 1st putt and he made bogey as well. Yang could have put it away, but still goes to #72 leading Tiger by one. Riveting. 6:32 ET Even in standard definition, Yang looks very strong. After a low-maintenance par at #16, Yang still leads by one with only 17 & 18 left. 6:17 ET Peter Kostis just said what I was thinking about Yang, "It's easy to play with nothing to lose when you don't have the lead. Now he's got the lead, it's time to see what he's made of." But sure enough Tiger and Yang both had misplays on the par-5 15th, and both settled for par. Then CBS lost the HD feed. 5:58 ET Wow! The "Tiger" moment came from Yang with a chip-in for eagle on the short par-4 14th. But Tiger didn't concede the trophy on the spot, he made birdie. Yang leads by one with 4 holes to go. 5:47 ET CBS suffered some serious technical glitches. They cleaned up the mess and are back on track, though they didn't acknowledge or apologize for the difficulties. Tiger hit a great tee shot to the par-3 13th, but couldn't convert. Yang scrambled from the sand and remains tied. Yang is proving to be a tough customer, but you have to think the big "Tiger" moment is coming soon. 5:36 ET Tiger came off a rare birdie with some rare trouble on #12, air-mailing the 515 yard #12. He couldn't save par and is tied with Yang for the lead again. The closest in the chase are still 3 behind, and running out of holes. 5:21 ET Neither Tiger or Yang converted on #10, but Tiger finally made his first birdie on the par-5 11th, getting 606 yards in two shots, then a run-of-the-mill 2-putt. He's at -7. Yang is -6. Nobody else closer than -3. 5:02 ET Glover and Lee Westwood are each three shots back and will remain that way, missing birdie putts on their respective par-5s (Glover on #11, Westwood on #15). Tiger and Yang each got lucky bounces on their drives on #10, and both can realistically make birdie. 4:37 ET This championship may be defined by what's transpired on the 8th hole. Henrik Stenson got reasonably close to the lead, but bogied. Glover made bogey. Harrington built a snowman. Tiger found the trap and he made bogey as well - he's two-over for the day. Yang hit the approach of the day on #8, but another no-confidence putt. He's tied for the lead with Tiger again, but noone has wrested the outright lead from him the entire week. Now Soren Kjeldsen is alone in 3rd, two shots back. 4:27 ET Harrington may have had that winning look, but he's still the guy who made an "8" down the stretch last week going mano-a-mano against Tiger. He put it in the water on #8, then botched his shot after the drop, then put a second into the water. Another "8" - all of a sudden Harrington looks less like Tiger and more like Mickelson. It's down to Tiger and Yang. 4:13 ET Yang flirted with tree trouble on #6 but blasted out of it. His birdie attempt lacked confidence. The pressure may be mounting on him. Tiger made another par. Harrington didn't take advantage of the par-5 7th, and has 7 straight pars. 3:57 ET Yang bogied #5, while Tiger churned out a workmanlike par. Harrington just barely missed birdie on #6. Glover dropped a shot, so he's two back. And Tiger is alone at the top again. But Harrington is starting to remind me of Tiger. He exudes confidence in his swing, his walk, and his stare. Think of Robert Patrick in Terminator 2: Judgment Day. 3:42 ET For the second day in a row, Tiger 3-putted the par-3 4th. Yang missed his birdie putt by inches, so he's now tied for the lead. Harrington and Glover are just one back. 3:31 ET Tiger has played well, if not great thru 3 holes. And like yesterday, he hasn't been close to any trouble. Harrington has flirted with trouble but has 4 pars. Yang made birdie on 3 and trails Tiger by one. Glover made a 2nd birdie on #5, and he's tied with Harrington at -6, within two. 3:15 ET Tiger was in position for a second straight birdie chance, but didn't convert on the putt. Yang looks rock-solid though it's only been 2 holes. No noise from Harrington. Lucas Glover with the first significant move of the day with a bird on the par-5 3rd, he's within 3 shots. 2:59 ET Tiger missed a great birdie opportunity on #1, sending his short putt wide. Yang played the first hole very solidly. Nobody from the field has made a move toward the top, yet. But you get the idea that another 71 from Tiger won't get it done.